A job interview is a tough competition with only one winner. But you can BE that winner - even if you aren't the most qualified candidate! Here's the key to getting hired: Avoid the mistakes most applicants make, and prepare yourself better than them.It is not difficult if you use a simple, step-by-step system.I will show you how. My name is Bonnie Lowe. If you are ready to win a better job, I will personally help you do it. Here is the good news: most of your competitors are lazy. Unlike you, they're not bothering to look for information on successful job interview strategies. Dear Bonnie, I got the job! Over 100 people applied for the position. I never would have thought of doing that on my own. I would still be looking for a job, had I not purchased your book. Yes, you really can win your next job interview! I purchased your System a few weeks ago, as I had an interview coming up for my dream job. I just wanted to thank you, because while I thought I had mastered the interview process (I've gotten jobs before), the one area I lacked skill in was those tricky HR behavioral questions. Previously I had been stuck for good answers, but after studying your notes and spending time thinking up relevant examples, I went into the interview prepared and confident. I'm happy to say that I got my dream job! Thank you so much for your excellent material. It was invaluable to me. Thanks to your book, I got 2 job offers in 2 months! Thank you so much. I have made a decision and I am happy about it. I will start at the new company in three weeks! You are the best!" Bonnie's Job Interview Success System is chock-full of advice on how to prepare for a job interview. Want to conquer the nervousness that has made you botch interviews? Bonnie tells you how. Think you're prepared because you know your resume well? You aren't. Bonnie tells you the REAL way to prepare. Do you know the 5 simple secrets to selling yourself? Bonnie does, and she spills the beans. That's only a taste of what's in the Job Interview Success System. Bonnie's advice is fantastic. She gives you tons of sample interview questions, and startlingly good answers. She even includes free personal email support! When I read that, my jaw dropped. I'm sure you know how rare that is in such an inexpensive product. I've traded emails with her. She's pleasant, helpful, and knows what she's talking about. For the price you pay (about as much as a typical monthly local phone bill), you get an incredible value. I can't recommend Bonnie's product enough. If you want to be extremely well prepared for your next job interview, her Job Interview Success System will get you there. You walk in confidently, fully prepared for what's ahead. You feel comfortable and relaxed, yet enthusiastic and eager to get the interview started. Your smile is genuine and you can tell they are pleased by your professional appearance and upbeat attitude as you shake hands. You answer their questions in perfect detail, as if they had been provided to you in advance. You surprise and flatter them with your knowledge of their company. You convince them that what you offer is exactly what they need. You leave the interview happy, knowing that you impressed the daylights out of them! "Congratulations! The job is yours! Blow Away The Competition And Get Hired! This System consists of 5 separate components that give you everything you need for an incredibly successful job interview. It's jam-packed with information on what you can expect, how you should prepare, and exactly what you need to do during every phase of the hiring process. It is all spelled out in a simple yet powerfully effective System that anyone can follow! Simple Strategies That Will Get You Hired"
There's no fluff and no goofy stuff. It's loaded with quality content and invaluable strategies you can use to ace your next interview and get the job you want! The three most common obstacles to a successful job interview, and how to avoid or overcome them. Your most powerful secret weapon for acing the interview and coming out on top, regardless of how good the other candidates are. The four essential components that are more crucial than your job qualifications. The initial step that most job seekers don't take, but that can have the biggest impact on your success and keep you from making a terrible mistake. A simple way to describe yourself that will guarantee you will be perceived as the candidate who is the best fit for the job. The three things you must do to give better answers to interview questions than anyone else. How to respond calmly and with confidence to unexpected questions. The seven qualities most valued by employers and how to use them to your advantage. Several of the most common interview questions and how to develop answers that will impress the hell out of the interviewers. The question most candidates will not ask their interviewer, but which can provide you with a huge advantage in selling yourself. Six aspects of your appearance you must check to ensure you make an outstanding first impression. An easy technique for impressing interviewers on the spot and having them admire your talent even after the interview is long over. How to make sure your references will provide rave reviews during inquiries about your performance and character. Six powerful strategies for acing the telephone interview. One of the simplest things you can do while waiting in the lobby that will make a unique and highly positive impact with the interviewer. The three elements of your attitude to demonstrate that will skyrocket your chances of getting hired. The four foolproof techniques that will make your greeting and introduction more memorable than those of any other candidates. The secret technique used by a few incredibly successful people to get what they want--and how to master it. The one thing you must never do at an interview--no matter how tempting it is. How to handle the salary question without knocking yourself out of contention. What your last comment should be before the interview ends--it is incredibly obvious but most people forget to say it. The four purposes of sending a thank-you letter and how to achieve each one. How to deepen your relationship with the interviewerafter the interview to move ahead of other candidates. Why you should never say "I'll take it!" when they call to offer you the job. How to maintain a favorable impression with a company even as you turn down their offer. The 12 essential things you should evaluate for every job offer in addition to the salary. It's loaded with the information you really need to avoid mistakes and ace the interview! Can you see how having access to this extraordinary collection of tips and techniques will make your next interview the best you've ever had? Imagine replacing your anxiety and doubt with confidence and enthusiasm! Human Resource managers, professional recruiters and career experts all agree: one of the best ways to prepare yourself for a job interview is to anticipate questions, develop your answers, and practice! There are plenty of websites that offer lists of common job interview questions, and knowing the types of questions to expect can be very useful. But knowing how to answer questions (even the unanticipated ones) can mean the difference between getting the job and getting the "reject letter." This comprehensive report tells you how to give a job-winning answer to any question, whether you anticipated it or not! It also lists 45 of the easiest, toughest, silliest and most common job interview questions; tells you why employers ask them; how to answer them; and gives you sample responses for each question. "5 Simple Secrets of Selling Yourself"
To get the job you want, you must sell yourself. Not only that, you have to be better at it than every other candidate! I know, I know... the thought of "selling" yourself may be somewhat unpleasant, especially if you're modest and don't like to blow your own horn. But it really is an essential part of the interview process. And don’t worry... there are easy and effective sales techniques that will help you "close the deal" (get the job) without making you sound like a pushy used-car salesman! This report tells you the five simple secrets of successful selling and exactly how to apply them to blow away the competition at your next job interview. "How to Follow Up Without Freaking Out"
One of the most common questions asked by job seekers is, "When do I follow up?" Then, "How can I follow up without sounding desperate or being perceived as too pushy?" Don't you just hate waiting? This report shows you how to make the most out of the waiting periods after you apply and interview for the job. It not only explains why companies can take such a long time to make a hiring decision, it shows you how to be patient, professional and persistent without being perceived as a pest! Discover what to do, when to do it, how often to do it, and when to stop doing it. An effective follow-up strategy is an essential part of your career-advancement quest, and this report spells it out for you. "The Job Interview Success Checklist"
This convenient tool will enable you to easily keep track of every step of your job interview process: the job title, source, company name, and all contact info. It includes a checklist of every task to be completed before, during and after the interview. It's specifically designed to go hand-in-hand with the Step-by-Step Guide, and it's an organizational tool you won't want to be without. Report 1: Impressive Resumes and Cover Letters. If you want to be hired for a great job, you need a great resume. This report shows you how to whip up a secret weapon that gives you an unfair advantage against the competiton. Report 3: The Power of Creative Selling. The only way to get a great new job is to convince the hiring manager that you are exactly what he needs and wants. In other words, "sell" yourself as the best "product!" This report is loaded with timeless tips and strategies that are used by the best sales people in the world, and I know it will help YOU get results! Report 4: How to Overcome Failure and Achieve Success. This remarkable, powerful little book was written by bestselling author Napoleon Hill. The title says it all! Start An Exciting New Career! Just wanted to share my thanks for your ebook about interviewing. Your advice in the book and when answering my questions definitely helped! I started a new position with Chicago Public Schools shortly after you helped me! There were over 90 people interviewed and I was chosen! Thank you! Bonnie, I have been searching for an IT job for 6 long months. I was about to give up hope when I came across your website. I revised my cover letter and prepared for the interview questions as suggested in your System. Guess what? I finally got an offer! I only wish I had found your website 6 months ago! Thank you so much! I am very good at my work as an Engineering Technician and knew I was qualified for a better position. But I had difficulty expressing myself during the interviews. I knew I could do the job, but I'd get so nervous that I'd interview very poorly. So I purchased your System. Your tips helped me prepare, and your words gave me confidence. I was able to communicate better at my next interview and I got the job. How much is a better future worth? Certainly much more than you will pay for the System that will get you there. Of course, you might consider hiring a professional career coach instead. This pro can give you many useful tips, show you what you're doing wrong, how to improve your interview skills... and charge you about $90 per hour, with a minimum 2-hour fee. For less than you'll spend on your "I got the job!" celebration dinner, you will make an investment that will make a positive, profitable impact on the rest of your life. Imagine if following this simple step-by-step System during your next interview and every interview you'll ever have throughout your career resulted in hearing, "You're hired!" Wouldn't that be worth much more than the price of this System? Order now and you can be preparing for the best interview of your life within just 5 minutes. Each Component of the Job Interview Success System is a digital file. You will receive simple instructions on how to download it right onto your computer. No shipping fees, no waiting for the mail. So what's the catch? Why is this System, that will give you the keys to success for every interview you have for the rest of your life, such a bargain? Well, it's really quite simple. Since you'll be downloading the Components of the System directly from the Internet I have no inventory and no fulfillment costs. I don't need to pay anyone to take the orders over the phone. This way I can pass along my cost savings to you. So you win and I win. But don't worry, downloading each Component of the System is a snap! Try it out for 60 days. If you are not 100% satisfied (for any reason) I will refund every penny, no questions asked. You know, having access to all the job-winning secrets in the world won't do you any good if you fail to apply them. I can't go into that interview room with you. But here's a promise... If you follow the steps in each Component of my Job Interview Success System, you will be more prepared, more confident, more polished and more impressive than you've ever been in your life! Of course, I would love to guarantee that you will be hired after your next interview, but I can't do that (after all, the boss's nephew may be applying!). What I can do is put my money where my mouth is. I understand if you're still skeptical. I know I can't expect you to just take my word for how wonderful my System is. That is why I ask you to see for yourself and try it entirely at my risk. Spend 60 days studying the entire System and putting the strategies to work during actual interviews. If what you learn does not help you during that time, I've failed. I'll give you every dime back. No questions asked, no hard feelings. You have nothing to lose by giving it a try. On the other hand, what great new job might you miss out on if you delay? Order now, and start your career advancement today! Your Next Job Interview Will Be Your Best! Think back to how your last job interview went. Now imagine if you had entered the interview totally prepared, self-assured, enthusiastic, and ready for anything. Think about how much better you'll do next time, armed with the amazingly effective ammunition in this System. "How to Create Attention-Grabbing Cover Letters"
Did you know that a dull (or non-existent) cover letter can significantly lower your chances of having your resume read and thus eliminate your opportunity for the job interview? On the other hand, an effective, attention-grabbing cover letter can tremendously boost your worth in the eyes of potential employers! The 5 most common cover letter blunders and how to avoid them. The 3 best ways to customize your cover letter so it grabs attention. The simple, step-by-step process to create an awesome cover letter that will impress its readers and make your lazy competitors look lame by comparison! It also includes a blockbuster technique that many people do not utilize, and a sample letter that pulls it all together. ALSO... The cost of my Job Interview Success System may be tax deductible as one of your job search expenses! Be sure to keep your receipt and ask your tax preparer about it. I have been a counselor for over 30 years. A few months ago I started researching the subject of job interviews so I could write a book on it. In doing the research I found plenty of information, but not a complete picture. After months of researching over 50 sites, I came across an all-inclusive system that was so good I was forced to cancel my plan to write a book on job interviews. 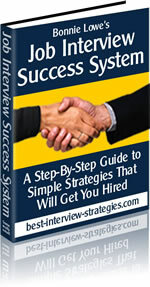 This system has everything a person needs to succeed in a job interview. It is so well put together, and so well written, that I didn't feel I needed to write another one. It's Bonnie Lowe's Job Interview Success System. I believe that Bonnie is the best person to help you in your quest for excellence in job interviews. She provides the best information available on the subject, anywhere, period! I looked through your offering and am just so impressed! You have encapsulated all the critical points that I have ever heard of and created plans of action to deal with them so beautifully.I love that your material is straightforward, simple, positive, supportive, and actionable right now! I am so excited to be able to recommend to my readers such high quality material! !